Fear me! I control ants! Here’s the perfect example of expectation affecting outcome. 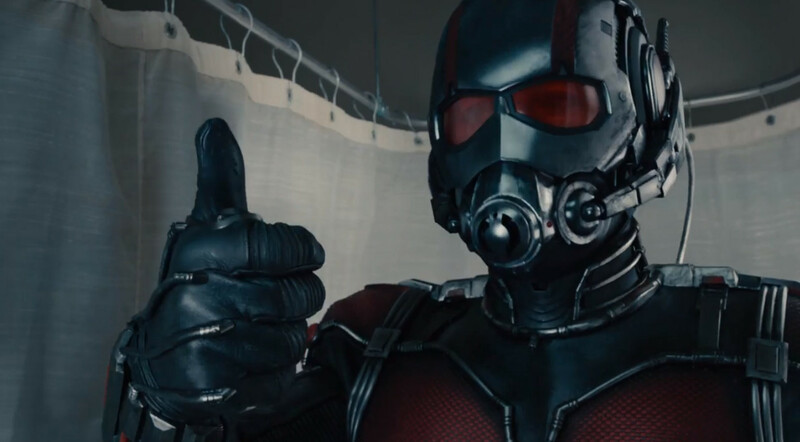 Let’s be honest: who was expecting anything out of Ant-Man? I know I wasn’t. I went in expecting a complacent, by-the-books, predictable superhero thriller. I left after getting that exact same thing. Okay, maybe I’m being a little rough. The movie does have its moments, and it did at times give me slight enjoyment and chuckles. But how can individual moments replace an entire movie? If you compare Ant-Man to its other giant-sized movie counterparts (The Avengers, Iron Man, Captain America: The Winter Soldier), you will always arrive to the same word to describe it: smaller. Taking place after the events of The Avengers: Age of Ultron, Ant-Man introduces Hank Pym (Michael Douglas), a genius scientist that rivals the intellect of Iron Man’s father Howard Stark (John Slattery). After realizing that the government was seeking his Pym particles, which allows him to turn into Ant-Man, to be weaponized, Pym goes into retirement, hoping to protect his particles from the world so that they would never be used for nefarious purposes. Enter Daniel Cross (Corey Stoll), Pym’s ex prodigy. In modern day, Cross re-created Pym’s particles in the form of Yellowjacket, a suit similarly designed to Ant-Man and outfitted with the same capabilities. Desperate to get the suit and to further protect his invention, Pym enlists the only individual who can help take up the Ant-Man mantle: Scott Lang (Paul Rudd), a notorious thief who has a knack for getting into places he doesn’t belong, and a daughter he’d do anything to see again after separating from her mother. It’s true, most probably didn’t think much about a superhero named Ant-man when this project was originally announced. But to be fair, this film does have some merit, despite its low expectations. The best thing I can say about Ant-Man is this: its fun. Meagerly fun, yes, but it still counts. So what happened? Simply put, Marvel happened. After a few creative disagreements between himself and Marvel, Wright left and Peyton Reed was hired in his place. Reed directed The Break Up and Yes Man before helming Ant-Man. Yeesh. Luckily, Ant-Man survived it’s lop-sided pre-production into release. Well, maybe “survived” isn’t an appropriate word. Dragged by its insect legs is more accurate. The biggest complaint about Ant-Man is that it’s inconsistent. Moments of heartfelt drama collide with out-of-place comedy. Comedy is bogged down by moments of forced emotion. The only thing that is consistent in the film is its action, which is surprisingly innovative to its premise. For instance: in the first scene where Scott shrinks as Ant-Man, he falls into a bathtub. Who would have thought falling in between droplets of water and cracks in the floor would be so exciting and interesting? The details we see when Scott shrinks are extraordinarily eye-popping, immersing us in this whole new world we didn’t see before in regular proportion. Seeing Scott traverse into ant hills that turn big when he shrinks, communicating with insects his size when he’s small, and finding new locations inside smaller ones are among some of the fantasies we see when he’s Ant-Man. Seeing him fight as Ant-Man is the most fun. Who knew that a Thomas the Train set could be so dangerous to two miniature super-beings? Other than the visuals though, the movie is sub-standard. It’s cookie-cutter in about every sense of the word. The comedy, the drama, and the acting is all forced for effect, and in the process, it has none. For Pete’s sake, even the movie’s villain is so bland. Who cares about some bratty little business executive who steals a powered suit for money, fame, and power? That was Obadiah Stane in 2007’s Iron Man, and he was a much more compelling villain than this standard archetype of an antagonist. It’s true, this film didn’t have much to go on when originally announced, but the idea doesn’t count as much as the execution. People doubted Guardians of the Galaxy when that came out, and people reversed their opinions and said it was greater than The Avengers after they saw the film. I believe those same people will watch Ant-Man with no reaction as he flies in the air and goes “splat” across their window pane. Footnote: If you do decide to watch Ant-Man, do not watch it in 3D. It has some of the worst particle effects I’ve ever seen in a 3D conversion, and I had to lift my glasses every five minutes to see how much brighter the film was without the glasses. I didn’t know that Ant-Man was supposed to be such a dark picture.